Ancient Stones - Lothian - 021 Caiy Stane, Fairmilehead, Edinburgh. The Caiy Stane is located in a small recess in the wall along the west side of Caiystane View, a few metres from the junction of Oxgangs road, Edinburgh. The stone is of red sandstone and reaches a height of 2.75m with a breadth of 1.60m. A weathered row of six cup marks can be seen at low level in its east side. The stone is said to mark the site of a battle between the Picts and the Romans. 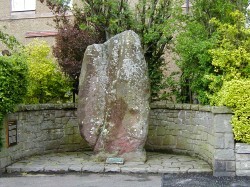 The Camus Stone, an alternative name for the Caiy Stane, may have actually been a separate stone and was believed to have been situated 200m south of the toll house. Though it gave name to a neighbouring estate, and formed the march stone of its eastern bounds, it was destroyed within living memory to provide materials for road repairs. A plaque by the stone gives further information. It has been suggested that astronomical alignments may exist with the Pentland Hills to the south west. Two very large conical stone cairns, called the Cat Stanes, once stood 25m to the east but were destroyed during 19th century road construction works. From Edinburgh City By-Pass take the Lothianburn Junction and head into the city. Turn left at the first traffic lights onto Oxgangs Road. Caiystane View is on the right. The stone is set into a small alcove at the side of the street. Easy parking is available in the streets around the stone. This is an impressive stone, despite standing in a residential area of Edinburgh. It must surely have been magnificent when the area was open fields with views all around, that being as recently as 1903. One the rear of the stone a series of cup marks can be seen and according to the National Trust for Scotland the stone may date back to 3000 BC with an association to Neolithic finds in the area.